Let me begin by stating that this blog is about 50% “family and friend newsletter” while the other 50% is just me writing for the fun of it. Todays blog is mostly about me, which is 99% of most blogs on WordPress (not about me personally, but about the writers themselves…so yeah) Have I lost you yet? I’m not much of a goal-setter. I have the usual goals of my workplace, in at 6AM and hopefully out at 4-ish, along with the normal stuff that commercial enterprises aspire towards, but personally…not so much. I don’t hunt, fish or golf. I’ve tried each with marginal results, and I don’t really like to do any of them. 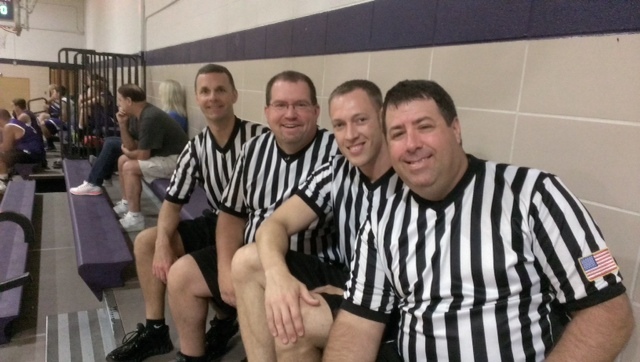 Last fall I thought that I’d try taking up officiating basketball games as I’ve wanted to try doing that for years. I went to the classes, did some on-court learning, read the rule book and case plays, took and passed both exams and was assigned low level games to cut my teeth on. As it turns out I learned two things. Number one…I love officiating. I can’t tell you why, I just do. Number two…I’m fairly good at it. When I started officiating late last fall I had hoped to ascend up to officiating varsity games within three to five years. Through four months I officiated over a hundred and fifty games, but mostly kids tourneys and no varsity. To work high school varsity games a ref needs to learn three-man mechanics, as there’s three officials on the court verses the normal two. The game itself moves very quickly, you look at “advantage-disadvantage” defense verses offense and the proper places to position yourself at on the floor and the rotations. Mainly…you want to be in place to make a call on a violation or foul in your primary coverage area as well as not being run into or over by the six foot two inch two hundred pound forward who just grabbed a blocked shot and is now dribbling down court hell-bent on beating the defender who is now in hot pursuit while you bust your middle-aged tail to get down court with or before them to be in place (again) to make any call on a violation or foul. That is officiating basketball in a snapshot. There’s plenty more to do but I won’t bore you with the details. In the past month I’ve attended two clinics to learn this three-man officiating thing. During the clinics you officiate varsity games with two other officials in front of evaluators who grade you on your officiating. They’ll tell you what you did right and wrong. If I did well I might be assigned to some varsity games for this upcoming season…which was my new goal. Varsity games in year two. During the first clinic in late June I did real well. Well enough to get a few varsity games coming my way this season plus I met some really nice guys who asked if I would work with them for a few games this season (one is an attorney while the other is a chemical engineer…so I really didn’t add much to the gene pool, know what I mean?) By the way, I have to pay to officiate in these clinics so its a little weird that way but you do it in the hopes that you’ll learn things to make you a better official, and its kind of like a job interview in front of conference assigners. A job interview where you’re running, and real sweaty while wearing black shorts, sox, shoes and a black and white striped shirt…all the while being yelled at by a coach who’s pacing the sidelines whining about “calling it both ways! !” So yeah…its a little surreal in that regard, plus I get to blow my whistle. During the second clinic, this past weekend, I attended with some buddies of mine. It was a couple of hours away so we got a hotel for the night. Joining us was a guy who I didn’t know but was joining us so that he could get some work in with my buddies as they had just formed a crew together. As awkward as it may sound, it wasn’t. My buddies have been officiating games for a combined total of twenty-four years, whereas I’ve officiated for nine months…so I was there to learn and hopefully get some attention from assigners. As a group of four we’d rotate in and out of games and had a great time together. Another nice thing about the guy I didn’t know…his name is Rich too, and he turned out to be a great guy. The second clinic went fine, I honestly felt that I had a better clinic four weeks earlier. I learned more from the guys that I worked with than anyone else. One moment pretty much sums up the weekend. During the first day we had a two hour break for lunch. Most world class athletes will “refuel” their bodies with foods and drinks designed to replace calories spent on the exertion of their sport. Not being world-class athletes we drove over to the Pizza Ranch and chowed down on fried chicken, pizza and dessert pizza with soft-serve ice cream slathered all over it all washed down with pop (while not exactly kosher for the moment you’ll never read of us testing positive for performance enhancing drugs either) While we all felt drowsy and needing a nap we soldiered onward and officiated another game while having a good time. Just friends working with friends. No “head-cases” or “ego trips” just guys working to help each other out and to be better at what they’re doing…and having a good time doing it. I also did well enough in those games that I was asked if I could work plenty of games from a guy who assigns many, many varsity games…so my goal was accomplished in that regard. The season is still a long ways off, I have yet to receive any sort of confirmation that said “varsity” games are mine to work. I may end up working as a fill-in official who gets called at the last moment to work for a guy who’s come down with an injury or the flu, but it sounds like I’ll get my chance this season to work where I had set my sights on. I also ran into my old high school coach, thirty years after the fact. He’s still coaching at the tender age of his late sixties. It’s a small world. From left to right…Me, Rich #2, Dan, Joel. We had to fight off a constant stream of groupies all gathered to watch us in our black shorts, black sox and black shoes trot up and down the court. Shameless vixens!! Don’t sell yourself short, Rich. You are much better than,”Fairly good at it.” You are probably the best almost-2nd-year official I’ve ever seen. You have a great attitude and an endless thirst for learning. I thank God that I met you through this little thing we do. Thanks Joel. That’s pretty high praise coming from such a good official. I had, and continue to have, exceptional mentoring. Thanks Dan! It was good working with you guys. Looking at the photo of the crew, I can’t help but think Pizza Ranch lost money on the buffet that day.